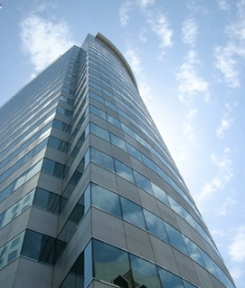 Characterized by its large office spaces and equipped with the latest bureau technologies, this 21-story office tower offers a wide range of facilities and full comfort for users. Situated on the corner of Najda and 13th Street in Abu Dhabi, the building provides a 2-story underground parking garage, a car showroom, 68 offices, a penthouse and a roof helipad. Challenge in focus: In this rounded façade building, dealing with a special custom-made radial false ceiling required a considerable amount of coordination between different trades and a special attention to details.